Our modern furniture includes equipped walls, bookshelves, drawers, cases, sliding and reclining shutters, wood panelling and other furniture solutions. 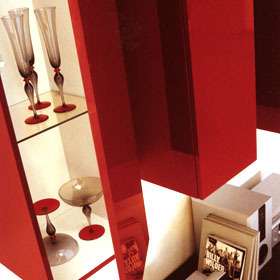 Thanks to the innovative design, the quality of the products, the refinement of the colours, our modern pieces of furniture may be perfectly integrated in all kinds of environment and, as they are modular units, we can create the proper piece of furniture to satisfy all customer requirements. Manufacturing companies offer several solutions employing modular units of different widths and heights, and offer the possibility to choose among cherry tree, durmast wood and lacquered colours. You and us together can design the module which may best meet your needs.